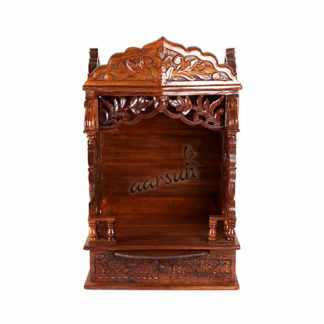 Wooden Temples always adds a whole lot of positivity and divinity to your home. 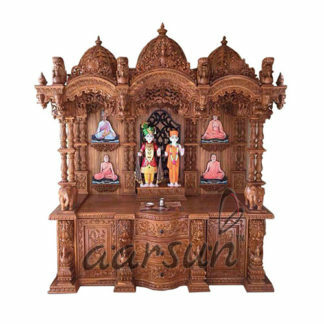 The Temple featured is hand-made by skilled craftsmen in Teak Wood also called Sagaun or Sagwan Wood at some parts of India. The Pooja Mandir has traditional floral designs which can be traced back to the Mughal ages. The basic structure of the Wooden temple consists of Dome at the top, Garbgriha at the center for keeping deities and the base might be supported by small legs or it can be plain to be hung on the wall. Then there comes some other additions to it depending on the requirement. Some wooden temples have one / two drawer(s) beneath the garbgriha while some prefers a whole cabinet below. It practically depends on your liking. The Temple above consists a beautiful mehraab in front with peacock carvings. The floral carvings extends to the whole Temple. The Top also consists of 4 shikhar at all corners. Beneath it is the braided carving separating the Top from the Garbgriha. The Garbgriha is guarded by dual pillars on each sides in front and half pillars at the back. The pillars of the Temple have Swan carving in front as well as at the sides. The Sides are in fact open and a small stroked railing is being provided on both sides. The base of the Temple have a single pull out tray for Dhoop-batti / Agarbatti / Diya and 2 drawers that extends to the depth of the whole Temple giving huge storage space for all your pooja essentials. The structure of the Wooden Temple is supported by 4 legs at the corners. The Temple resembles the actual Stone Temples every city has. The Temple is floor standing. However, the supporting legs can be removed and wall mounting provision can be added at the back for the Temple to be hung on the wall. As we are the manufacturers, the unit can be customized as per your home decor and requirements. Even the design can be changed as per your need. Contact us at +91-8266888634 / 8192999135 for customization and delivery time-frame.